Here’s a fun, new project that allows you to effectively promote adoption while thanking your area birthmothers for giving life to their babies. 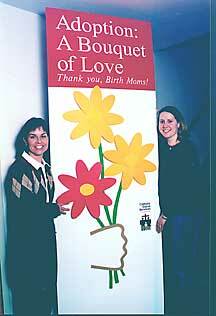 Bouquet of Love is the creation of Catholic Social Services Beginnings Adoption program in Dayton, Ohio. Participants request a petal packet by mail, then they write a heartfelt message of how adoption has touched their own life. Some simply thank the women who have placed their babies into the waiting arms of adoptive parents. The writer remains anonymous by giving a first name only. The petals are then returned and assembled into larger-than-life bouquets for public display. The Dayton organization kicked off Bouquet of Love on Mothers Day in May. So far, the display has traveled to over 19 different public locations throughout the Dayton area. Some of the places include malls, churches, libraries, hospitals, a university, fair and park. The display will continue through November, which is National Adoption Month. The many people who see the bouquet are impacted with a positive and loving message about adoption. This project could also be used as an effective fund-raising event. Each petal could be sponsored by a donor who would send a financial gift to a crisis pregnancy center, right to life organization, etc. Laura Roesch, a counselor with Beginnings Adoption program, and her group feel it is vitally important to let birthmothers know how much society appreciates their incredible gift of love to childless couples. This is one way we can show how much we love them, and how grateful we are that they chose adoption as a solution to a crisis pregnancy, she said. If youd like more information regarding Bouquet of Love, contact [Catholic Social Services of the Miami Valley].